This is a place I know from my childhood. I used to go there with my brother and my father when I was still a child. The park is now in much better shape and with lots of different sports to practise. 1º de Maio park is located north from Alvalade Quarter. It’s a small Oasis in the town centre. The park was built in 1959 and from that date, thousands of members and non-members gathered here to enjoy sports such as football, tennis, mini-golf, basketball and others. I enjoy playing Tennis, even knowing I’m not that good. But playing Tennis isn’t as complicated as it seems. The problem is that if you quit playing for one month, your game will drop to a level that you’ll be severely ashamed of. 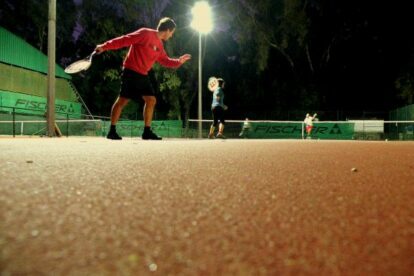 A good idea would be renting a court at night to practice your game, right? I guess playing Tennis is still a good way to get yourself in shape and burn some calories for it gives your arms and legs a good workout. I enjoy playing at 19:00 or 20:00. because it’s cooler, and, if you’re not as good as Nadal… you better might play when no ones looking. When the sun goes down… Game on!